The world is getting ready for UFC 116 tonight! 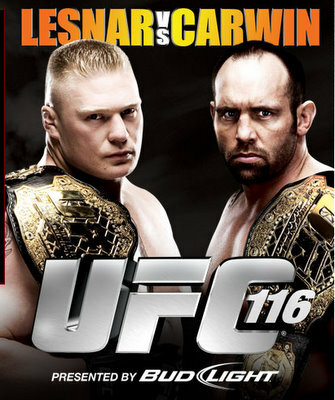 The featured fight is the heavyweight championship match between Brock Lesnar and Shane Carwin. These two fights are heavy, fast, powerful, and ready to lay claim to the undisputed heavyweight UFC championship. Of course you can watch the UFC 116 bouts on Pay Per View tv. But the majority people on the web are wondering where in the world they can watch the fights online! That’s where Yahoo Sports comes in. You can now watch the UFC 116 fights via pay per view on Yahoo Sports MMA.